During one of my scrap sorting sessions, I collected up a pile involving these colors. I started with that pile and filled-in with some other fabrics I had and before I knew it, I was making a quilt for the day when my 3-year-old Ruby gets a twin-size bed. While I had intended to use a flannel sheet for the quilt back, looking at some of Denyse Schmidt’s minimalist quilt designs inspired me to piece together the quilt back with some large pieces of corduroy I had. Now, I almost like the back as much as the front, and have two quilts in one. While I have a million quilts in my head that I want to make, I barely have time to do one. Well, rather, the time I spend making a quilt is time I rightfully should spend doing other things: cleaning the disaster zone that is my home, for one, getting the proper amount of sleep, for two. This is only the second standard-size quilt I’ve ever done, and with big quilts, the last part of the process can be intimidating. 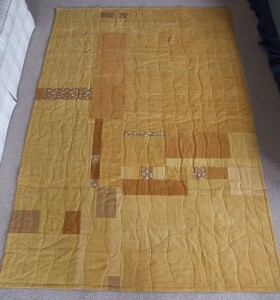 I had finished the top and back, so I was ready to sandwich, baste, quilt and bind. These last four steps to assemble the layers of your quilt into a finished product are often considered the drudgery of the quilt making process. You’ve already done the fun creative part to get the look you are going for, now it’s time to buckle down to the work of assembling the darn thing. It’s the perfect time to get one’s mother involved, if you ask me. As luck would have it, my Mom was coming up for a visit. She is the helpful sort and must love me a great deal because she agreed to help. Well, needless to say, I was very grateful for her help! With her help, we were able to quilt it fairly quickly. I did her nifty trick of leaving enough overhang from your back to fold it around for your binding. So the binding went quickly too. 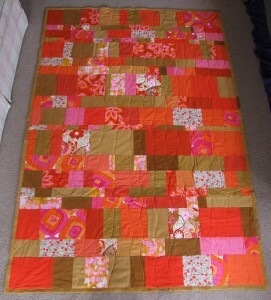 Then, Voila, a real, live finished quilt! Now this is the kind of project that feels like a real accomplishment to complete! 100% recycled fabrics with new cotton batting. You have a gift for color & design. Love the boldness. Beautiful! 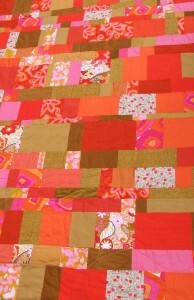 I love the colors and agree – you have two gorgeous quilts in one. I want to see that binding!